Please complete the form below and click Submit when you are finished. 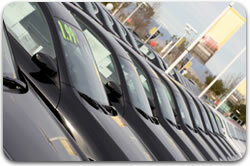 We will contact you with a quote in one business day or less. 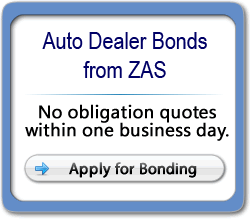 Please enter information below for all bondholders of the dealership. For multiple bondholders, click "Add Bondholder". (if yes) Please provide the name of the Trust. I understand that to process my application, Zurich Agency Services, Inc., its related entities, agents, affiliates, and/or assigns or the insurance company that it represents ("ZAS") may request a consumer report or investigative consumer report concerning my character, general reputation, personal characteristics, mode of living, credit worthiness, and criminal record, as well as regulatory inquiries, such as state insurance inquiries, and interviews with and inquiries to third parties. By checking this box *, I hereby authorize ZAS to conduct any or all of these inquiries. I authorize, without reservation, any party or agency having knowledge or information set forth above, to furnish the above-mentioned information. If appointed, this authorization shall remain on file and shall serve as ongoing authorization for ZAS to procure consumer reports or investigative consumer reports at any time during my appointment period. For Maine applicants only: Upon request, you will be informed whether or not an investigative consumer report was requested, and if such a report was requested, the name and address of the consumer reporting agency furnishing the report. You may request and receive from us, within five business days of our receipt of your request, the name, address and telephone number of the nearest unit designated to handle inquiries for the consumer reporting agency issuing an investigative consumer report concerning you. You also have a right, under Maine law, to request and promptly receive from all such agencies copies of any records. For New York applicants only: You have the right, upon written request, to be informed of whether or not a consumer report was requested. If a consumer report is requested, you will be provided with the name and address of the consumer reporting agency furnishing the report. For Washington applicants only: If we request an investigative consumer report, you have the right, upon written request made within a reasonable period of time, to receive from us a complete and accurate disclosure of the nature and scope of the investigation. You have the right to request from the consumer reporting agency a summary of your rights and remedies under state law. · If a consumer credit report is obtained, I understand that I am entitled to receive a copy. I have indicated here whether I would like a copy. Yes No · If an investigative consumer report and/or consumer report is processed, I understand that I am entitled to receive a copy. I have indicated here whether I would like a copy. Yes No *California applicants: If you chose to receive a copy of the consumer report, it will be sent within three (3) business days of ZAS's receiving a copy of the consumer report and you will receive a copy of the investigative consumer report within seven (7) days of ZAS's receipt of the report (unless you elected not to get a copy of the report).